Cartesian robot /Gantry robot: Used for pick and place work, application of sealant, assembly operations, handling machine tools and arc welding. It's a robot whose arm has three prismatic joints, whose axes are coincident with a Cartesian coordinator. Cylindrical robot: Used for assembly operations, handling at machine tools, spot welding, and handling at diecasting machines. It's a robot whose axes form a cylindrical coordinate system. Spherical/Polar robot: Used for handling at machine tools, spot welding, diecasting, fettling machines, gas welding and arc welding. It's a robot whose axes form a polar coordinate system. SCARA robot: Used for pick and place work, application of sealant, assembly operations and handling machine tools. It's a robot which has two parallel rotary joints to provide compliance in a plane. Articulated robot: Used for assembly operations, diecasting, fettling machines, gas welding, arc welding and spray painting. It's a robot whose arm has at least three rotary joints. Parallel robot: One use is a mobile platform handling cockpit flight simulators. It's a robot whose arms have concurrent prismatic or rotary joints. Industrial robots are found in a variety of locations including the automobile and manufacturing industries. Robots cut and shape fabricated parts, assemble machinery and inspect manufactured parts. Some types of jobs robots do: load bricks, die cast, drill, fasten, forge, make glass, grind, heat treat, load/unload machines, machine parts, handle parts, measure, monitor radiation, run nuts, sort parts, clean parts, profile objects, perform quality control, rivet, sand blast, change tools and weld. Outside the manufacturing world robots perform other important jobs. They can be found in hazardous duty service, CAD/CAM design and prototyping, maintenance jobs, fighting fires, medical applications, military warfare and on the farm. Farmers drive over a billion slooooww tractor miles every year on the same ground. Their land is generally gentle, and proven robot navigation techniques can be applied to this environment. A robot agricultural harvester named Demeter is a model for commercializing mobile robotics technology. The Demeter harvester contains controllers, positioners, safeguards, and task software specialized to the needs commercial agriculture. Some robots are used to investigate hazardous and dangerous environments. The Pioneer robot is a remote reconnaissance system for structural analysis of the Chornobyl Unit 4 reactor building. 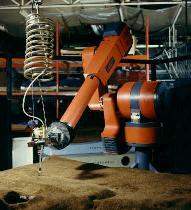 Its major components are a teleoperated mobile robot for deploying sensor and sampling payloads, a mapper for creating photorealistic 3D models of the building interior, a coreborer for cutting and retrieving samples of structural materials, and a suite of radiation and other environmental sensors. An eight-legged, tethered, robot named Dante II descended into the active crater of Mt. Spurr, an Alaskan volcano 90 miles west of Anchorage. Dante II's mission was to rappel and walk autonomously over rough terrain in a harsh environment; receive instructions from remote operators; demonstrate sophisticated communications and control software; and determine how much carbon dioxide, hydrogen sulfide, and sulfur dioxide exist in the steamy gas emanating from fumaroles in the crater. Via satellite, Dante II sent back visual information and other data, as well as received instruction from human operators at control stations in Anchorage, Washington D.C., and the NASA Ames Research Center near San Francisco. Dante II saves volcanologists from having to enter the craters of active volcanoes. It also demonstrates the technology necessary for a robot to explore the surface of the moon or planets. That is, the robot must be able to walk on rough terrain in a harsh environment, receive instructions from remote operators about where to go next, and reach those commanded goals autonomously.Robotic underwater rovers are used explore and gather information about many facets of our marine environment. One example of underwater exploration is Project Jeremy, a collaboration between NASA and Santa Clara University. Scientists sent an underwater telepresence remotely operated vehicle (TROV) into the freezing Arctic Ocean waters to investigate the remains of a whaling fleet lost in 1871. The TROV was tethered to the surface boat Polar Star by a cable that carried power and instructions down to the robot and the robot returned video images up to the Polar Star. The TROV located two ships which it documented using stereoscopic video cameras and control mechanisms like the ones on the Mars Pathfinder. In addition to pictures, the TROV can also collect artifacts and gather information about the water conditions. By learning how to study extreme environments on earth, scientists will be better prepared to study environments on other planets. Space-based robotic technology at NASA falls within three specific mission areas: exploration robotics, science payload maintenance, and on-orbit servicing. Related elements are terrestrial/commercial applications which transfer technologies generated from space telerobotics to the commercial sector and component technology which encompasses the development of joint designs, muscle wire, exoskeletons and sensor technology. Today, two important devices exist which are proven space robots. One is the Remotely Operated Vehicle (ROV) and the other is the Remote Manipulator System (RMS). An ROV can be an unmanned spacecraft that remains in flight, a lander that makes contact with an extraterrestrial body and operates from a stationary position, or a rover that can move over terrain once it has landed. It is difficult to say exactly when early spacecraft evolved from simple automatons to robot explorers or ROVs. Even the earliest and simplest spacecraft operated with some preprogrammed functions monitored closely from Earth. One of the best known ROV's is the Sojourner rover that was deployed by the Mars Pathfinder spacecraft. Several NASA centers are involved in developing planetary explorers and space-based robots. The most common type of existing robotic device is the robot arm often used in industry and manufacturing. The mechanical arm recreates many of the movements of the human arm, having not only side-to-side and up-and-down motion, but also a full 360-degree circular motion at the wrist, which humans do not have. Robot arms are of two types. One is computer-operated and programmed for a specific function. The other requires a human to actually control the strength and movement of the arm to perform the task. To date, the NASA Remote Manipulator System (RMS) robot arm has performed a number of tasks on many space missions-serving as a grappler, a remote assembly device, and also as a positioning and anchoring device for astronauts working in space. you're reading my article in my blog The Types of Robots and you can find something The Types of Robots ini dengan url http://technologyfactory.blogspot.com/2011/12/types-of-robots.html, you can publish and copy paste for you The Types of Robots it's very use full The Types of Robots sumbernya. Nice article! I believe robon will be crucial in lending a hand in future, especially when new technologies and apparatus are often offered. In particular, industrial robots will totally give some advantages in economy of every country!